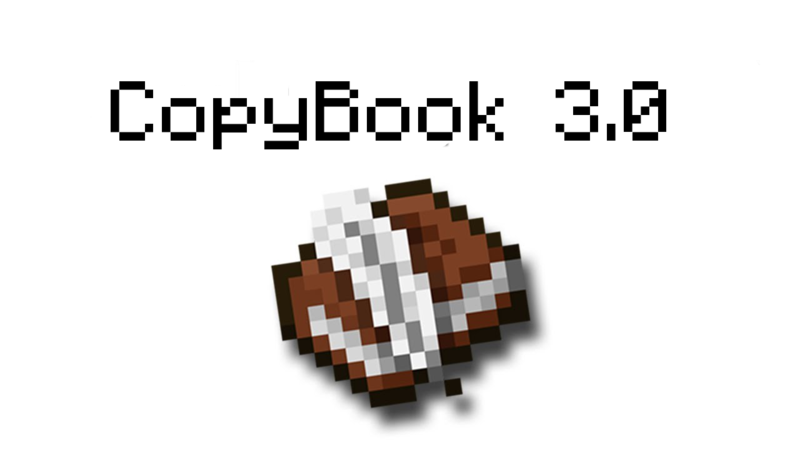 CopyBook is a simple, clean plugin for copying, saving, and loading books. If you ever get tired of copying books by hand, this plugin is for you. If you need a simple way to distribute books, this plugin is also useful. Load books from the individual files to your inventory. Copy books from your hand into your inventory. Give another player a book from your hand into their inventory. Console can give books to players, useful for command blocks and such. Players can copy books into chests that they are looking at. Sign support (video tutorial coming) - Players can create signs to distribute books, with or without a price. Update Notification on server startup if there is a new version available. Configure whether players have to have a book&quill in their hand in order to edit books, load books, or get them from signs. Configure whether pricing is enabled, what the default price is, whether people with the copybook.bypass command can bypass the price, and which commands are exempt from pricing. /cpb help - Lists all of the CopyBook commands. /cpb save - Saves the book in your hand to a book-specific file. /cpb load <bookname> - Loads the specified book and places it in your inventory. (Server-side command only) - cpb give <player> <bookname> - Gives the specified player the specified book, loaded from a file. copybook.main - Main permission for all commands. copybook.help - Permission to use the help command. copybook.give - Permission to use the give command. copybook.save - Permission to use the save command. copybook.load - Permission to use the load command. copybook.copy - Permission to use the copy command. Currently, the plugin works fine; however, these are some of the things I am going to do in the next updates. Currently, there are no known bugs! Please don't hesitate to contact me if you find one, however. Excellent plugin, very useful and compatible with new versions of MC. I definitely recommend this for server use. Not yet but thanks for the idea! I will add that to the to-do list that will probably appear in the next update. Look great I will try this one on my server! Is it possible to copy books to a chest? Chest you are looking at. That will be great to fill chests with info books for players. Thanks for the plugin!